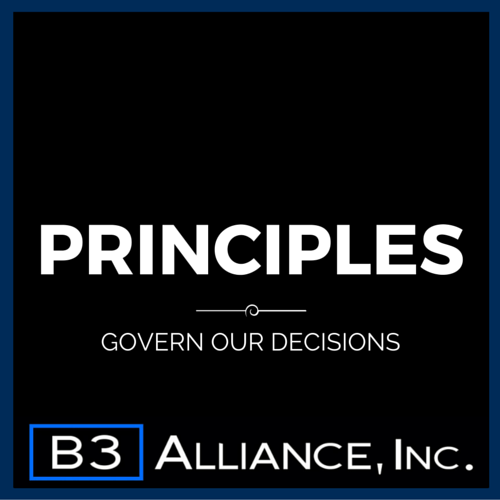 Philosophy | B3 Alliance, Inc.
Our mission is to grow your bottom line. Every working moment we ensure the work we do and the relationships we build become long term assets for our clients. Our mission’s remained the same since day one. By focusing on performance as our purpose, we align our productivity to our client’s interests. Values are ideas we hold dear. These are the intangible, the abstract, and they exist on a continuum. Values are never completely reached but always worked towards. Our values are therefore aspirational and core to our business and its continuous growth. 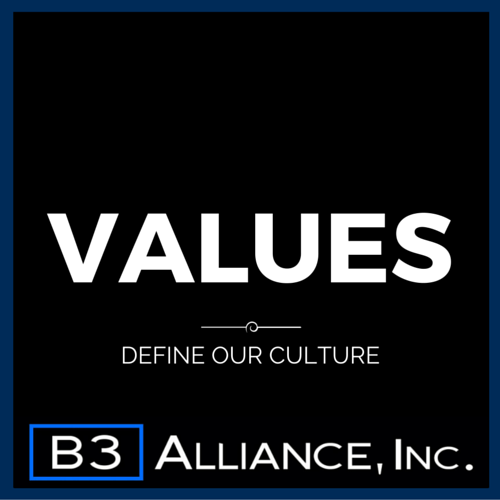 Values are the things we long to achieve in our work every day and demonstrate the influence we aim to represent as an organization. Our values are the core of our culture. Our inquisitiveness, and constant questioning allows us to build our collective intelligence. We believe that value is infinite and we can create it through innovative processes and feedback. Constant improvement means continuous learning and iteration. That’s how we move our firm forward. Great work comes from great motivation. Our drive for our respective specialties shines through. Our commitment to service comes from feedback, open communication, and anticipating your needs. Building great products or services comes from putting ourselves into our end-users shoes and perspectives. We believe focus is a muscle you build over time. Our speed of execution derives from this value. Openness is something we drive towards. We believe light cleans all through review and critique. We recognize that great understanding requires openness and the ability to interpret new facts. Beauty is a subjective trait, but we know it when we see it. We drive to evoke emotion in our work. Review Our Services to see how we can help you. Our principles are ways we interpret our values and beliefs in tangible ways that allow us to make decisions. They are the foundation of our process on all aspects of our operations. From hiring, to performance based incentives, and reviews for growth, and the foundation of our decision making. We live up to these principles in our work and seek to develop them through each work situation that presents itself. They are the foundation of our performance. We look to build momentum, seek results, adapt, and capitalize on the value we create in our work. Design is when function and art align. Consumer deserve great design as a cornerstone of experience. We devote and build long-term with our people, clients, processes, technology, and services. We earn and keep through feedback, honesty, results, and a commitment to a long-term mission. We honor privacy as a cornerstone of our professionalism, and to build any meaningful relationship. Great contemporary ideas, often began as minority opinions. Diversity allows us to see what’s next. To discover the unknown, we have to develop and test hypothesizes to push the boundaries forward. We do what we say. And say what we’ll do. Our word is paramount to our legacy and work. “What’s measured improves.” Just as true when Peter Drucker said it, and fundamental to our processes. We believe in openness to other’s experience. Empathy is core to our understanding and service. We don’t just add to your bottom line. While efficiency and cost savings built the backbone of our growth, our ability to help our clients innovate and expand their business adds to your top line performance. We develop our services by focusing first on the return we’ll generate for our clients, and then our relative strength in the field. We see how we can exceed the competition. If we can’t compete as a top firm for any line of service – we won’t develop it.